Towering at the center of the new Upper Buena Vista district is a sprawling, 80-year-old ancient oak tree. 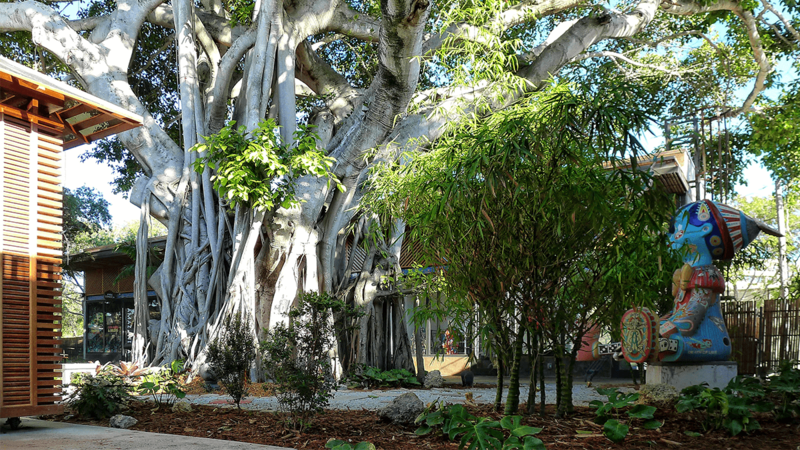 Its branches stretch out over a substantial portion of the complex, offering delicate shade from the bright Florida sun. The oak, a symbol of strength and stability, grounds the ethos of Upper Buena Vista. Cofounder David Lahmy says it’s no coincidence Upper Buena Vista was built around the majestic oak. The recent arrival of a shopping and entertainment district in Miami’s urban center is certainly not a novel concept — but Upper Buena Vista, with its tranquil, minimalist design and unique microboutique model, certainly sets a different bar for local retailers. As more and more developers are rightly catching heat for rapidly gentrifying Miami’s most impoverished neighborhoods, husband-and-wife developers Michal Aviv and David Lahmy are carving a new path. They’re committed to creating an environment that supports local makers and creators through affordable rental space while safeguarding the neighborhood’s historic roots. Inspired by an emerging trend in London and New York, Upper Buena Vista’s microboutiques are an attractive option for emerging retail entrepreneurs. These relatively low-cost retail spaces are designed for incubating concepts while keeping consumer prices down. Upper Buena Vista is a collection of retail shops, 500-square-foot microboutiques, and 250-square-foot “petite boutiques” housed within an airy, open-concept cooperative. Most of the spaces rent for about $1,700 a month for 250 square feet; the priciest space rents for around $2,300. Upper Buena Vista houses a variety of spaces for culinary, art, fashion, and beauty clients, and plenty of local favorites have signed on for the ride: Café Crème, Kraken Crudo, and Fratelli Milano will all open outposts alongside recognizable fashion boutiques such as Wynwood Shades, Iniva, and House of Findings, the popular Lincoln Road Antique Market pop-up shop. “It’s very important for us that the people who are going to be selling here reflect our vision, our idea of the community,” Lahmy says. Upper Buena Vista’s community-oriented vision is executed with eclectic design choices, and an odd combination of influences works surprisingly well. Inspired by what Lahmy calls the “four T’s” — Tel Aviv, Tulum, Thong Sala, and Tokyo — Upper Buena Vista’s founders tapped a diverse team of architects to bring the project to life. “When you start designing, you realize very fast that most of the people in Miami are doing boxes, everything looks the same, and that’s why we had the collaboration of three architects in this project,” Lahmy explains. A collaboration among Modis Architects, Brillhart Architecture, and Colombian architect Juan Camilo Gordillo, the complex features retail buildings resembling traditional Japanese temples, with colorful patterned tiles and expansive floor-to-ceiling windows lending a serene, bohemian vibe. White clay benches and thatch-roofed huts have been strategically placed around the complex, and lush vegetation has been planted all over the grounds. According to Lahmey, no detail was spared — most decorative materials were sourced from far-flung locales such as Tunisia and Myanmar, and an Iranian artisan handmade a variety of fixtures. In a city facing a major affordability crisis driven by rising real-estate costs and a quickly advancing development scheme, another retail development in the heart of Little Haiti can feel a little unsettling. Just down the street from Upper Buena Vista, Miami’s Design District swells with opulence and luxury consumer goods. By contrast, Lahmy and Aviv pledge to integrate residents into their new venture. They’ve hired locals for a variety of roles, including construction, and are relocating any residents who lost their homes after the founders purchased the land for redevelopment. The notion that Upper Buena Vista would be an accessible alternative option to its southern neighbor is precisely what attracted Fiorella Blanco, the co-owner of Fratelli Milano, to the complex. “I was speaking with a Buena Vista neighborhood resident, and she likes to dine out but has no options she can afford,” Blanco notes. In bringing her celebrated downtown Miami eatery to Upper Buena Vista, Blanco aims to offer the same affordable menu options lauded by her frequent customers. “There’s a need for a full-service Italian restaurant in the neighborhood, and we’re going to have a menu that caters to everyone, whether you’re searching for an $8 salad or a $30 filet mignon,” Blanco says. She notes the Upper Buena Vista menu will be an elevated version of her downtown menu — the restaurant will specialize in vegan options and take a less conventional approach to fine Italian cooking. “We’re going to work a lot with seasonal ingredients, crudos and tiraditos, and work very much with local producers,” she says. The restaurant — also offering a full-service rooftop bar and operating in the afternoons and through the evening — will anchor the complex. For the cocktail menu, Blanco partnered with consultant 13 Shakes, whose team is designing unique menus for the restaurant and rooftop. Blanco plans to host frequent concerts and Sunday brunches as the space grows. “We saw the opportunity to offer all of this close to home and cater to our neighbors,” she says.